I was given this award by the talented Sandra. I have to link back to Doreen's blog (I think), and pass this onto 12 other people. 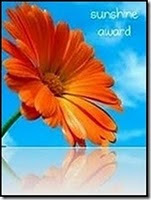 I wish I could give this award to all the lovely people who visit my blog but I can only chose 12. I have chosen these people because they visit my blog because they want to not because I have entered a challenge. (Don't take this the wrong way I really appreciate all my lovely comments). I have listed them in alphabetical order by name (just because I'm a bit OCD about putting things in order, even if it only makes sense in my mind). Please hop over to these blogs as you won't be disappointed. Debbie, Elaine, Elaine, Gina, Jennifer, Jodi, Kerry, Lorraine, Mina, Pops, Steph, Sundownerin. All you ladies are an inspiration to me and I really enjoy reading your blogs. I hope you will accept this award with pride because you deserve it. Thank you so much Poppet for thinking of me, very much appreciated. Aaawww poppet, thank you so much! I really do love chatting with you and looking at your beautiful cards and scrap pages! Oh WOW!! Thank you Poppet for thinking of me! You are just too sweet! !